"This is my favorite tea! It's delicate in taste and powerful in effect." 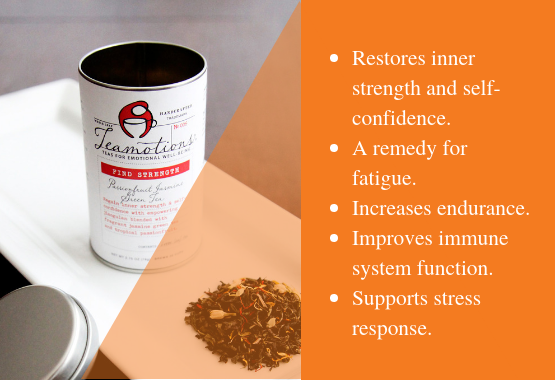 Find Strength was created to bolster inner-strength and self-confidence with eleuthero root and jasmine flowers in a blend of fragrant jasmine green tea and tropical passionfruit. Ingredients: Organic Green Tea, Organic Eleuthero Root, Organic Jasmine Green Tea, Organic Safflower, Jasmine Flower, Organic Marigold Petals, Organic Natural Flavor. Purposefully crafted for emotional well-being. Strengthening eleuthero root and empowering jasmine flowers are used in this blend to restore emotional and physical energy and improve self-confidence. Eleuthero root, an adaptogen from China helps restore emotional energy, physical strength, and mental fortitude. Jasmine flowers help improve self-confidence, lift mood, and relieve stress. We recommend drinking Find Strength anytime you are under stress and need an extra boost. Your tea ritual should be your own and something you look forward to every day. Use the guidelines below to make a delicious cup of Seek Peace and don't be afraid to add your special touch! The Perfect Cup: Pour 8oz of 180 degree filtered water over 1 rounded teaspoon of loose and steep for 3 minutes. Take in the uplifting aroma while you wait, then strain and enjoy. Resteep for a delicious second cup. Self-care for mind, body, and soul. OFFERING COMFORT AND INSPIRATION IN ANY CIRCUMSTANCE. Blended with balancing adaptogen herbs and nourishing botanicals, each blend helps boost immunity, improve the body's response to stress, and restore well-being in every way. Used daily our teas will make a positive difference in how you feel. Try it today and see what Find Strength can do for you. What are people saying about Find Strength?